Next Challenge? Citrus not Salt! The Challenge: Lower your sodium intake by replacing salt in your recipes with a splash of citrus! WHY: Sodium causes people to retain water thus water weight. By decreasing the amount of sodium on consumes over the course of one week - a person can drop more than five pounds of added water weight. What’s not to love about that? Do not eat out for the week you are decreasing your sodium intake. Even low fat restaurant fair is packed with sodium and not just fast food faire. Eat food closest to its natural state. Choose fresh food rather than frozen or canned with added sodium. Hide the salt shaker. Cook with herbs and spices that are salt free rather than using that salt shaker and never add salt at the table. Fresh citrus juice can be used in place of salt to flavor your food, particularly on items such as baked or broiled salmon, mahi mahi, tuna and vegetables such as asparagus, broccoli and cauliflower. 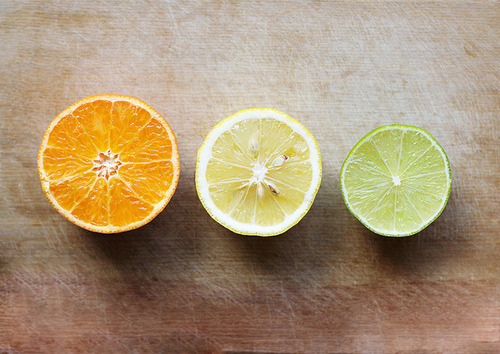 Lemons, limes, oranges … Which came first, the fruits or the color names? My wife always has a handful of lemons and limes around and a bowl full of these things looks great on the counter. Now I know they’re around for more than their looks! Carla said something this lesson that may stick with me the rest of my life: Use lime juice, instead of salt, to brighten up flavors. And lemon juice everywhere, of course, for the same purpose. I know salt is divine — every cooking show on TV features chefs tossing handfuls of the stuff into everything they make — but those of us on involuntary low-salt diets need all the help we can get not to feel left out. I’ll be exploring lime and lemon juice (and other salt substitutes) further, I’m sure. So will my wife. Thank you, Carla! Found an old ipod- got some new music!